Continue on to read the full details and information straight from EA SPORTS. When is the EA SPORTS UFC 2 beta? The beta drops on January 28, 2016, and ends on February 4, 2016. This will be great opportunity to experience EA SPORTS UFC® 2 before the game launches on March 15, 2016, in North America. Is the EA SPORTS UFC 2 beta open to everyone? 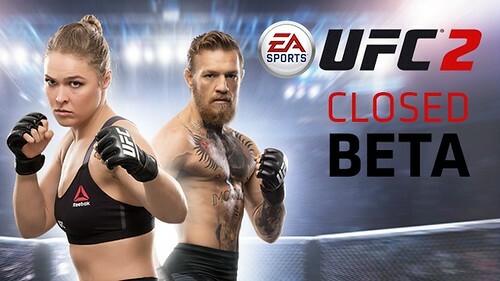 This is a closed beta and is only eligible to fans who own Xbox One or PlayStation 4 and are EA SPORTS UFC owners in North America. If you meet these requirements, you can register here for a chance to receive a beta code. You must register by January 21, 2016, at 10:00 AM PT for a chance to receive a code. The beta is only available to play on PlayStation 4 and Xbox One. The beta concludes on February 4, 2016. Exact time will vary by platform and by region. On Xbox One and PS4, the download will be about 11 GB. What time will the beta be available to download on January 28? Exact time will vary by platform and by region. You cannot pre-load the beta. What game modes will be available in the beta? There will be two game modes available to play in the EA SPORTS UFC 2 beta. Featuring the deepest roster of any fighting simulation, select fighters from the Welterweight division and step into the Octagon for a 3 or 5 round bout. Create your team of up to five fighters using UFC 2’s deep customization options. Compete in online or offline competitions in the Welterweight division to progress your fighters and earn Coins that open packs which deliver special items used to sculpt your team into the most explosive in the UFC. A no-consequences environment designed to let you master the basics of striking, grappling and clinch-work at your own pace before putting your skills to the test in real competition. Dive into all-new mini-games to help players learn and perfect stand-up, clinch, and ground disciplines. Can I play online against other players? The EA SPORTS UFC 2 beta will support online play. You can throwdown against (1) online opponent in a 1 vs. 1 fight. Will I be able to customize my fighter in the beta? Yes. In UFC Ultimate Team you can create your own team of custom fighters. After each fight, win or lose, earn Coins to open Fight Packs that contain items that improve your fighters. These items allow you to customize your fighter by giving them unique moves, attributes, perks and more. Will my UFC Ultimate Team stats carry over to the main game? No, any stats or progression during the beta will not carry over to the full game when EA SPORTS UFC 2 launches in March 2016. However the skills you learn through this beta will! Will I have to re-create my Ultimate Team when EA SPORTS UFC 2 launches on March 15? Yes, teams created in the beta will not carry over to the full game. I have EA SPORTS UFC through EA Access, can I still join the EA SPORTS UFC 2 beta? If you have a question that has still not been answered please visit our EA Help page here. I'm loving the betas on games now. Good as a demo and help fix bugs. I really hope EA does this for Madden. With so many issues last year it took way too long to make franchise playable. After waiting so long I stopped caring. Not sure if I'll get Madden this year and if I do I may wait awhile. Tired of the many bugs and problems - many of which are tied to the joint of franchise and myplayer mode crap that I don't care about. I don't like the RPG nature of franchise mode. Beta invites going out around 1 PM CT on Thursday (1/28). Beta codes going out through e-mail now. The beta is just over 11 GB in size.